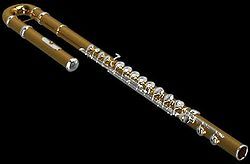 The alto flute is a type of Western concert flute, a musical instrument in the woodwind family. It is the next extension downward of the C flute after the flûte d’amour. It is characterized by its distinct, mellow tone in the lower portion of its range. It is a transposing instrument in G and, like the piccolo and bass flute, uses the same fingerings as the C flute. It was the favourite flute variety of Theobald Boehm, who perfected its design, and is pitched in the key of G (sounding a perfect fourth lower than written). Its range is from G3 (the G below middle C) to G6 (4 ledger lines above the treble clef staff) plus an altissimo register stretching to D♭7. The headjoint may be straight or curved. British music that uses this instrument often refers to it as a bass flute, which can be confusing since there is a distinct instrument known by that name. This naming confusion originated in the fact that the modern flute in C is pitched in the same range as the Renaissance tenor flute, therefore a lower pitched instrument would be called a bass. Pictured above is the ‘curved head’ version, frequently preferred by smaller players because it requires less of a stretch for the arms, and makes the instrument feel lighter by moving the center of gravity nearer to the player. 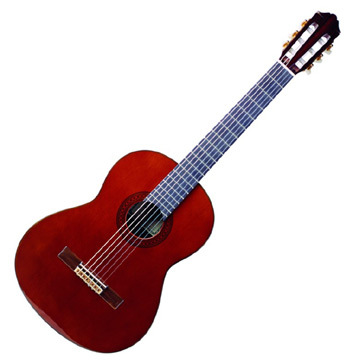 However, the straight version is more commonly used for better overall intonation. The embouchure for alto flute is similar to that for C flute, but in proportion to the size of the instrument. Hence the embouchure-hole sits lower on the lower lip, and the lip-aperture is wider. The following lists are not intended to be complete, but rather to present a representative sampling of the most commonly played and well known works in the genre. The lists also do not generally include works originally written for other instruments and subsequently transcribed, adapted, or arranged for alto flute, unless such piece is very common in the repertory, in which case it is listed with its original instrumentation noted. In the classical literature, the alto flute is particularly associated with the scores of Igor Stravinsky and Maurice Ravel, both of whom used the instrument’s distinctive tone color in a variety of scores. It is featured in Ravel’s Daphnis et Chloé, Stravinsky’s The Rite of Spring, Franco Alfano’s opera Cyrano de Bergerac, and Sergei Prokofiev’s Scythian Suite. Shostakovich used it in his operas The Gamblers (incomplete), Lady Macbeth of the Mtsensk District (also known as Katerina Ismailova), as well as in his Symphony No. 7 (Leningrad). It also figures prominently in several movements of Gustav Holst’s The Planets. It also appears in Howard Shore’s music for The Lord of the Rings among many other contemporary film scores. Even before 1940 it had been used occasionally in Hollywood; early Broadway pit orchestrations using the instrument include Jerome Kern’s Music in the Air (1932) and Very Warm for May (1939), both scored by Robert Russell Bennett (the manuscript orchestrations are in the Jerome Kern Collection, Music Division, The Library of Congress). A number of specialist alto flute players have emerged in recent years. These include French improvisor/composer Christian Le Delezir, American Chris Potter, British Kingma System alto flute player Carla Rees, jazz player Ali Ryerson, American Peter Sheridan who currently resides in Australia, and Swiss composer/performer Matthias Ziegler.